Liberals need to keep their anti-gun/anti-NRA sentiment alive, and now they are doing it in disguise of honoring the young victims of Newtown, CT. This photo was included in the email. It’s called “Brought to you by the NRA” and was painted by New York artist Michael D’Antuono. Krause describes it as “a direct and unforgettable indictment of the NRA.” He fails to explain how the NRA had anything to do with Sandy Hook and why they should be indicted. 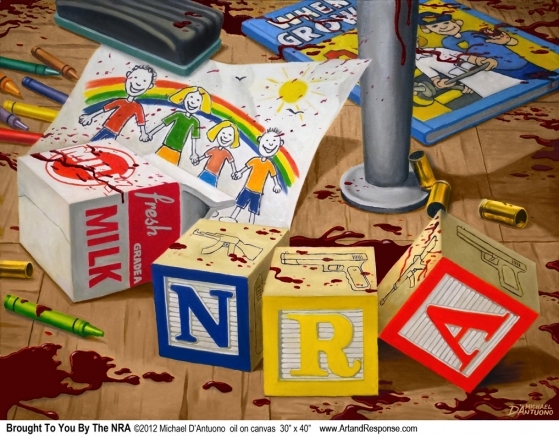 Instead, the piece gives the idea that the NRA specifically targets children because of the guns on the blocks. The NRA has never done or said anything to make people believe they want to influence children, hate children, or that they want them dead. Ironically, Krause’s website says the NRA is calling for armed guards in schools and “they” (no explanation who “they” represents) say more guns and more violence is not the answer. Will he retract this statement because President Obama proposed the exact same thing yesterday. He wants a fund for 1,000 school resource officers at a cost of $150 million. The website has a few more examples, and none of them honor the victims. Instead they target gun control. These examples are gory, horrific and extreme. It appears Krause is more interested in insulting the NRA than remembering the victims because these items do nothing for their memory. Breitbart News Editor at Large Ben Shapiro said President Obama stood on the graves of the children of Sandy Hook to push gun control. Krause and these artists are standing on the very same ground.